Organic spirulina tablets are a superfood which are suitable for a vegetarian, vegan, kosher, and halal diet. It is high in a range of healthy nutrients including antioxidants, vitamins, phytonutrients, and omega fatty acids. Plus it is non-gmo. Available in 120 tablet and 240 tablet sizes. This is a flexible and delicious superfood that can improve your diet and health. Never miss a dose of mother nature's multi-vitamin with our convenient spirulina tablets. Spirulina is extremely high in protein and has an extensive list of health benefits. The United Nations has even recognized the potential spirulina has to end the fight against world hunger. Spirulina has over 100 vitamins and nutrients - more than any other plant, herb, or grain. Take four 500mg tablets a day (with our without food) to get a complete serving of spirulina. Our Spirulina comes from sustainable farms in south India with ideal temperatures for growing year round. PACKED WITH HEALTHY NUTRIENTS | Spirulina has as many antioxidants as 5 servings of fruits or vegetables and 20 times more iron than spinach. It is high in protein, phytonutrients, fatty omega acids, vitamin A, and minerals too! So go ahead, make it a key element of your daily diet today. 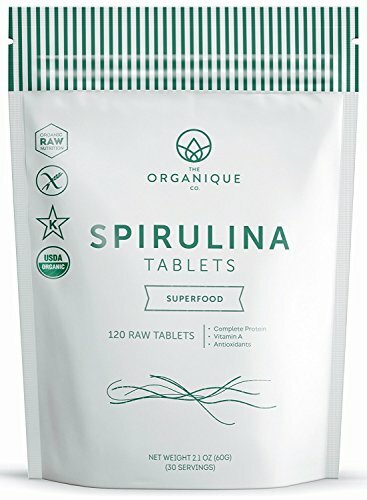 SUPER FLEXIBLE | The Organique Co. Spirulina is in a concentrated tablet form and a formula that ensures that the nutrients are bioavailable for increased absorption. Take it with a breakfast smoothie, juice, or shake. You'll also love it with a lunchtime yogurt or with your evening dinner. BOOST YOUR HEALTH | As a superfood, spirulina tablets will protect and detoxify your body, and balance your pH level. It does this by offering a wide-range of benefits to your body's natural defenses. Its phytonutrients will aid blood health, while the overall formula will support your cardio-vascular system to achieve an active lifestyle. MADE WITH CARE | Here at the Organique Co, we believe that you only get back what you put in, and protecting our natural world is everyone's duty. Our spirulina is grown from algae using certified techniques and thoughtfully packaged for a long life. QUALITY GUARANTEED | The Oranique Co. spirulina is certified organic by USDA, Naturland, OCIA and Ecocert. It's also kosher, halal, and vegetarian, free of all artificial additives, heavy metals, soy, gelatin, and GMO ingredients. If you have any questions about this product by The Organique Co., contact us by completing and submitting the form below. If you are looking for a specif part number, please include it with your message.